For Seoulites living in concrete slabs, Buam-dong and Pyeongchang-dong in Jongno District provide an escape from the din and bustle of city life. 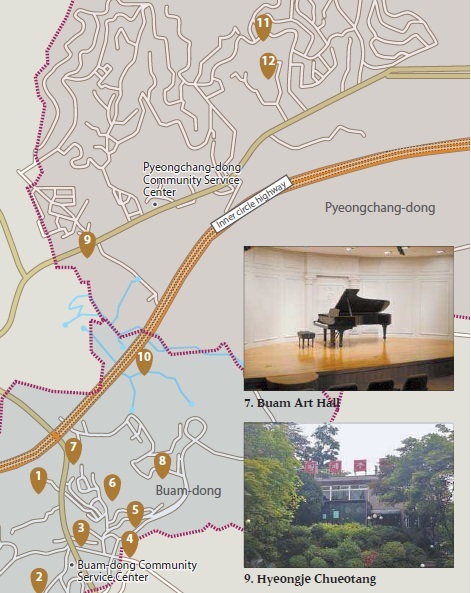 The two neighborhoods, nestled among Mount Bukhan, Mount Bugak and Mount Inwang, are located just north of Gyeongbok Palace but ideal for tranquil getaways with their museums, cafes, great views and traditional eateries. Nice low-rise houses line the streets, providing interesting scenery for passersby. So if you feel like leaving the city this weekend but don’t want to spend hours in traffic, a trip to the heart of Seoul is highly recommended. Even just a half day is long enough. Seokpajeong, a group of wooden buildings from the late Joseon Dynasty (1392-1910), is nestled at the foot of the northeastern side of Mount Inwang. The wooden structures were once used as a vacation home for Heungseon Daewongun (1820-98), one of the most important political figures of the era and the father of Gojong, the last king of the Joseon Dynasty. The complex is now part of the Seoul Museum, so one needs to purchase a ticket to enter. Seokpajeong consists of four separate buildings, but the Sarangchae, a space for visitors, offers the most spectacular view, as an old tree estimated to be more than 100 years old stands just outside. The museum is open from 11 a.m. to 6 p.m. Tuesday through Sunday. Admission for adults is 9,000 won ($7.80). Built in 1910, Mugyewon is a hanok, or traditional Korean house, which has experienced the ups and downs of Korean modern history. At first, it was an ordinary house, but in 1953, it became a restaurant. Ohjinam was Seoul’s first registered restaurant. The restaurant later turned into a yojeong, or upscale club, that was frequented by big-name politicians back in the 1970s and ’80s. All the major political decisions were made there. The hanok used to be located in Ikseon-dong, Jongno District, but was relocated to Buam-dong in 2014, and part of it has been renovated. After the relocation, the hanok was named Mugyewon and is now used as a multipurpose cultural space. Various programs, from tea ceremonies to lectures on humanities, are held throughout the year. You don’t have to sign up for the classes, though. Looking around the building is itself worthwhile because the wooden building has everything you’d expect in a beautiful old hanok. The cultural space is open from 9 a.m. to 6 p.m. Tuesday through Sunday. Jebikkotdabang, which means Violet Teahouse, attracts people who are interested in art because it has a gallery and a studio. At the studio, cultural classes are on offer, from simple drawing classes to lectures on how to make films with smartphones. Jazz performances are also available every Wednesday night for cafe visitors. The performance starts at 8 p.m. and lasts about two hours. Admission is free of charge if you order a beverage. The cafe is open from 1 p.m. to 11 p.m. Tuesday through Sunday. Along with espresso-based drinks, the cafe also serves simple dishes such as hamburger steaks, which are 15,000 won. The restaurant has been serving all sorts of dumplings for 20 years. For those accustomed to strong flavor of artificial seasoning, the dumplings here may taste bland, but culinary insiders say this is the best dumpling place in Seoul. The restaurant also makes its own soy sauce, which is aged for more than six months. The restaurant is located in a cozy old two-story house with a front yard. The tables on the second floor offer picturesque views of Mount Inwang, making everything seem more delicious. All the dumplings contain meat, but options for vegetarians are also available. A dumpling stew is 12,000 won. This rice cake shop has been in operation for more than 40 years. Because the exterior of the retro building is constructed with red brick, photographers often visit this place. The shop is open from 4 a.m. to 5 p.m. and is closed on Sundays. Rice cakes start from 2,000 won. The museum opened in 1992 to honor the painter Kim Whanki (1913-74), who is often said to be the pioneer of Korean modernist painting. Along with a permanent exhibition of Kim’s artworks, the museum also showcases the works of young artists. The museum is open from 10 a.m. to 6 p.m. Tuesday through Sunday. The Buam Art Hall, which opened in 1995, is dedicated to all kinds of classical music performances. Unlike in its early years, the art hall stages more experimental performances these days. Since the concert hall accommodates only 160 people, performers are able to interact closely with the audience. Of all the programs, the Saturday classical concert is highly recommended because all seats cost 20,000 won, much cheaper than other classical concerts. Fittingly, the name of this cafe, located at the corner of Mount Bugak, means “mountain corner.” After the cafe was featured on the 2007 hit romantic comedy series “The 1st Shop of Coffee Prince,” couples began frequenting the coffee house on dates. Since the cafe is located on a hill, you can take in the views of Mount Inwang and Mount Bugak while sipping coffee. An americano is 8,000 won. The cafe is open from 10 a.m. to 9 p.m.
Hyeongje chueotang, or brother’s loach soup, is a famous dish in Seoul. Loach is considered an invigorating food. The restaurant first opened in 1926. At first it was a pub, but it later transformed into a restaurant specializing in the fish soup. A bowl of original Seoul-style loach soup is 12,000 won, but the eatery also serves loach soup in the style of the Jeolla region. Baeksasil Valley, located behind the Blue House, was off limits to visitors for 40 years after a group of North Korean spies attempted to kill former President Park Chung Hee in 1968 by going through the valley and sneaking into the Blue House. The Kimi Art Gallery is a small museum that opened in 2004. It usually displays the works of young, budding artists. Since the art gallery occupies a two-story house, it looks like a grandmother’s cozy home. The cafe on the second floor offers a good view of Pyeongchang-dong. The gallery is open from 10:30 a.m. to 7 p.m. but the cafe operates until 11 p.m. The art center compiles the works of contemporary Korean artists, from newbies to established artists. It’s the perfect place to get an overview of Korean contemporary art. The building is also impressive – it was designed by French architect Jean-Michel Wilmotte, who also designed Incheon International Airport. The gallery is open from 10 a.m. to 7 p.m.